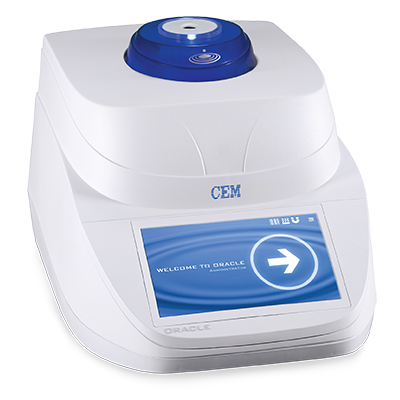 (Matthews, North Carolina) March 21, 2017 - CEM Corporation, a leading supplier of innovative testing solutions, is pleased to announce that it’s new ORACLE Fat Analyzer was named one of the top new products at Pittcon by Instrument Business Outlook. The ORACLE, based on a very recent breakthrough in NMR technology, is the first ever rapid fat analyzer that requires absolutely no method development and can analyze fat in any unknown food sample with reference chemistry accuracy and exceptional repeatability. ORACLE has the potential to become the new worldwide standard for fat testing and replace the classical chemical methods which are slow and outdated. It is used in food processing labs for quality and process control and can now be used in high throughput central food testing labs with the addition of an automated robotic option. Since the introduction of ORACLE in October 2016, it has been well received in food production and testing labs. CEM is proud to offer an innovative solution to meet the demands of today’s manufacturers. CEM Corporation, a private company based in Matthews, North Carolina, is a leading provider of innovative laboratory instrumentation. The Company has subsidiaries in the United Kingdom, Germany, Italy, France, and Japan, as well as a global network of distributors. CEM designs and manufactures systems for life sciences, analytical laboratories and processing plants worldwide. The Company’s products are used in many industries including pharmaceutical, biotech, chemical and food processing, as well as academic research.